I was perusing The Gospel Coalition materials again today and was reminded of this statement, in the Theological Vision for Ministry, on reading the Bible. Extremely helpful in how it brings together two ways of approaching Scripture often set in antithesis. (2) How should we read the Bible? a. Reading “along” the whole Bible. To read along the whole Bible is to discern the single basic plot-line of the Bible as God’s story of redemption (e.g., Luke 24:44) as well as the themes of the Bible (e.g., covenant, kingship, temple) that run through every stage of history and every part of the canon, climaxing in Jesus Christ. In this perspective, the gospel appears as creation, fall, redemption, restoration. It brings out the purpose of salvation, namely, a renewed creation. b. Reading “across” the whole Bible. To read across the whole Bible is to collect its declarations, summons, promises, and truth-claims into categories of thought (e.g., theology, Christology, eschatology) and arrive at a coherent understanding of what it teaches summarily (e.g., Luke 24:46-47). In this perspective, the gospel appears as God, sin, Christ, faith. It brings out the means of salvation, namely the substitutionary work of Christ and our responsibility to embrace it by faith. How this reading of the Bible shapes us. (1) Many today (but not all) who major in the first of these two ways of reading the Bible—that is, reading along the whole Bible—dwell on the more corporate aspects of sin and salvation. The cross is seen mainly as an example of sacrificial service and a defeat of worldly powers rather than substitution and propitiation for our sins. Ironically, this approach can be very legalistic. Instead of calling people to individual conversion through a message of grace, people are called to join the Christian community and kingdom program of what God is doing to liberate the world. The emphasis is on Christianity as a way of life to the loss of a blood-bought status in Christ received through personal faith. In this imbalance there is little emphasis on vigorous evangelism and apologetics, on expository preaching, and on the marks and importance of conversion/the new birth. (2) On the other hand, the older evangelicalism (though not all of it) tended to read across the Bible. As a result it was more individualistic, centering almost completely on personal conversion and safe passage to heaven. Also, its preaching, though expository, was sometimes moralistic and did not emphasize how all biblical themes climax in Christ and his work. In this imbalance there is little or no emphasis on the importance of the work of justice and mercy for the poor and the oppressed, and on cultural production that glorifies God in the arts, business, etc. (3) We do not believe that in best practice these two ways of reading the Bible are at all contradictory, even though today, many pit them against each other. We believe that on the contrary the two, at their best, are integral for grasping the meaning of the biblical gospel. The gospel is the declaration that through the death and resurrection of Jesus Christ, God has come to reconcile individuals by his grace and renew the whole world by and for his glory. I was looking today at Robert Webber's book with its title that rivals the length of Edwards' treatises, The Worship Phenomenon: A Dynamic New Awakening in Worship is Reviving the Body of Christ. Dr. Webber has been associated with the Emerging Church, an association that in some ways is legitimate and in other ways is either an unfair insult or an unmerited compliment (depending on your view of the EC). Anyhow, some of the same concerns I have with some clearly identified with the EC, I have with this book. I don't want more information about God. I want God! I understand the sentiment. So many of us know what it is to sit through a church service or a chapel message or a theological lecture and all it is is dry pontification. No heart in it. The answer, though, is not the kind of statement made here, because we get more of God through information about him, not by neglecting such information. Consider the many statements scattered throughout the New Testament about the importance of sound doctrine and of handing down the apostolic message. The avenue to delight in God is not by skipping the mind and doctrine but by using doctrine as kindling for joy. Hence the name of this blog. Worship is undergoing a shift . . . from the Newtonian world of mechanism and rationalism to a new concept of the world that recognizes dynamic movement and mystery at the very core of life. With the old world view, worship was static. It fit the mechanistic and rationalistic mind-set of the world. But now, with people's life expereinces changing to include dynamic movement and more participation, a worship that does not also move in this direction will become increasingly tedious and out of step with the world people are living in. Really? That's the solution? To mold our worship to the forms people are already living in? I know we should be aware of the ways we are heirs of the Enlightenment, but . . . really? This book sets forth an easy-to-follow blueprint for worship renewal in the local church. Hmm. A blueprint for renewal. Sounds pretty mechanistic and rationalistic to me. I'm being a bit hard on Dr. Webber; in truth, I was stirred at several points to wake up from my own lethargy when it comes to authentic worship, to rejoice all over again in the gospel. This post is not a condemnation. (It's a conversation!) I learned and was edified from this book at many points. But these are the kinds of statements I find in some recent Christian writers genuinely seeking to help the Church that make me concerned with their poor historical analysis (e.g. the Pietists, Watts, and Wesley are labeled as too "emotional" at one point in this particular book) and, even more, with the quest for spiritual experience through the avoidance, rather than the cultivation, of clear doctrine. Which, to me, is like the quest to try to get warm from a fire by avoiding the use of logs. If I've earned a rebuke, let me have it. If I'm missing something, let me know. I invite your correction. I can't believe I get to wake up in the morning, go study the Bible all day, and come home to my happy wife and adorable son. I believe it may properly be said, indeed must be said, that God alone is beautiful in an absolute and unqualified sense. All created reality, be it the raw elements of nature untouched by human hands or the paintings of Rembrandt, is beautiful in a derived sense and only to the degree that it reflects the perfections of God. In God alone are perfect order, harmony, magnitude, integrity, proportion, and brilliance. In Himself, independent of any benefit or blessing of His which we might enjoy, God is beautiful. One of the ways Sam has helped me is in thinking of the glory of God in terms of beauty. After critiquing N. T. Wright a few times this week I ought to say something nice, which is easy to do after reading the exchange between him and Bart Ehrman, the UNC religion prof who left the faith in his 40s on account of the problem of evil and suffering. Here is the exchange - they each wrote three short statements, responding to each other. I was very moved by what Wright said and how he said it. Just noticed this: Christ and Caesar: The Gospel and the Roman Empire in the Writings of Paul and Luke by Seyoon Kim, due out by Eerdmans in Sept 2008. In light of recent personal wrestlings with N. T. Wright's understanding of the gospel, I hope Kim can help me. At this point in my development, I think Wright sets as a controlling analogy ("gospel" in Greco-Roman usage; i.e., the proclamation of who is lord) what is undeniably present but ought to be placed in the background, and passages such as Isa 52:7 in the foreground, of Paul's concept of "gospel." When Wright is asked for his down-and-dirty definition of the gospel, reduced to its core, 15 words or less, footnotes and caveats aside, he goes to Rom 1 and defines the gospel as "Jesus is Lord" (see interview below, Apr 23, for an instance of this). I would go to 1 Cor 15 and define it as "Christ died for our sins." I continue to fail to understand how the proclamation of Jesus as Lord is good news to those who know themselves (as I do) to be treasonous rebels against that Lord (as I am). Jesus as Lord is only good news to me if the lordship that he exercises is lordship on my behalf, a kingdom of which I am a citizen, and that can only be the case if a still more fundamental problem is dealt with: sin. 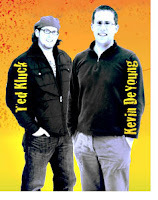 Just finished Why We're Not Emergent (By Two Guys Who Should Be) by Kevin DeYoung and Ted Kluck. Kevin is a 30-yr old pastor in Michigan and grad of Gordon-Conwell, and Ted plays arena football, is a published sports writer, and a member of Kevin's church. They don't write the whole book together as one voice but alternate chapters--Kevin writes a longer, more substantive chapter, followed by a shorter, more anecdotal chapter by Ted, a strategy that I thought worked well. Maybe in days to come I'll have a chance to write something more substantive but I do want to say now that I found the book very helpful. Fair, humorous at times, and most importantly gets inside the EC before critiquing it. Also, it's written by those in my own generation rather than the one above us. So far almost all of the literature advocating the EC has been written by guys under 40 and under (with the exception of Scot McKnight) and the literature critiquing the EC by guys over 40. At times, therefore, it feels like a battle between generations. Until this book. It is a book I will gladly recommend to peers who are working through the strengths and weaknesses of the Emerging "conversation." Happy to see the website for this new church is almost complete--with the best picture for a church home webpage I've ever seen. That is precisely the premise of the name of this blog. We must get the recipe right (doctrine) in order to maximally enjoy the pie (doxology). This is not, however, what Professor Sweet is saying. In context, his statements are not about the fundamental value of theological knowledge. He is talking about the fundamental value of cultural knowledge. He goes on to talk about how crucial it is to know and understand our postmodern times. And gets it, in my opinion, precisely wrong. There are many helpful things I'm learning from Dr. Sweet. But the flavor of the book is that knowing our culture is the key to ecclesial health in the twenty-first century. I believe knowing our God--through the Bible, in clearly demarcated propositional statements couched in a larger story of redemption--is the key to ecclesial health in the twenty-first century. Fascinating video interview of N. T. Wright at Asbury Seminary (with Ben Witherington pitching him softballs). Includes Dawkins, The Golden Compass, C. S. Lewis, the role of doctrine, Piper, the gospel defined, justification, imputation, the Reformation and its reading of Paul, baptism, and American Episcopalianism. Lots that is helpful and insightful, lots that is frustrating (e.g. unfortunate caricatures). Reading David Wells' The Courage to Be Protestant: Truth-Lovers, Marketers, and Emergents in the Postmodern World (Eerdmans '08), which is a distillation and reworking of his previous 4-book series (No Place for Truth, Losing Our Virtue, God in the Wasteland, and Above All Earthly Pow'rs). An extremely insightful handful of books. He has reflected long and hard on both the Bible and on the world and culture around us--helpful in ways similar to D. A. Carson in this respect. So if you don't want to read all 4 in the series, I suggest reading this most recent one. A due and weighty sense of the greatness and holiness of God, a sense that will reach into our lives, wrench them around, lift our vision, fill our hearts, make us courageous for what is right, and over time leave behind its beautiful residue of Christlike character. ...are two things I'm thinking and reading about these days. So it was fascinating to see this statement in an emerging writer, Spencer Burke, creator of the (now gone) emergent website "The Ooze." Been reading E. P. Sanders, Spencer? I realize the context of both writers is very different, but still: weird. Back from T4G. A great time, mostly because I got to hang out with two of my favorite people. The reason is was a great time is that I didn't realize how much I needed to stop the academic work, lift my eyes up, and see what all my studying is for: advancement of a clear, soul-saving gospel to a world quenching its thirst with the sand of sin instead of the living water Christ freely offers, if we will only leave our resumes behind. No posting till the end of the week as I'll be in Louisville for Together for the Gospel. Calvin always believed that even his scholarship was only justified by its utility. "In all your studies," he wrote to a fellow pastor, "you must be careful that they are not for your amusement, but for the service of the church of Christ. Those who seek in scholarship nothing more than an honored occupation with which to beguile the tedium of idleness I would compare with those who pass their lives looking at paintings." Fascinating interview of Sinclair Ferguson by C.J. Mahaney, in four parts. Aspiring students of the New Testament are always on the lookout for tools to help them build facility in the Greek language. The most common need—and, until recently, the most glaring lacuna—are tools that take them beyond introductory grammars without requiring them to struggle through the text with nothing but the Greek text on one side of the desk and BDAG on the other. Since 1966 NT students have had help from Max Zerwick, whose Grammatical Analysis of the Greek New Testament eliminated the need to be constantly (and frustratingly) flipping through BDAG, giving readers a running analysis of uncommon words and syntactical constructions. Zerwick’s work is unwieldy, however; its binding prevents it from lying open by itself, and it also caused those who utilized it to carry around two volumes instead of one. More recently, the NT has been even made more accessible to beginning Greek students by projects in which immediate lexical aid is provided in the Greek text itself, allowing beginning students and pastors to read extended portions of the NT with only one volume in hand. The most recent installment is an edition of the well-known UBS edition, edited by Bruce Metzger, the Alands, and others (The UBS Greek New Testament: A Reader’s Edition [Stuttgart: Deutsche Bibelgesellschaft, 2007]; hereafter UBSRE). Barclay Newman has compiled the running lexical aid. This volume has taken its place on my desk as the best of its kind. I thought it might be helpful to someone out there (!) to compare this project with the similar one produced by Zondervan, A Reader’s Greek New Testament, edited by Goodrich/Lukaszewski and released in 2003 (hereafter ZNT). The similarities between the two are obvious: both provide an extremely practical tool by providing definitions of every word that occurs fewer than thirty times in the Greek NT. Some of the differences are obvious upon immediately flipping open both texts, and these ultimately show that the UBSRE is more user-friendly than the alternative. First, UBSRE utilizes standard font for the Greek text (with OT quotations italicized), whereas ZNT, like the standard UBS text, has italicized the Greek (with OT quotations in bold; the 2007 2d edition does, however have non-italicized font). Second, the lexical aid that takes up the bottom half of the page in both volumes is easier on the eyes in UBSRE, since while ZNT provides a running list in unbroken paragraph form—making location of the desired definition needlessly difficult—UBSRE simply provides two vertical columns on each page, making rapid scanning between the Greek text and lexical definitions as painless and as speedy as possible. Third, UBSRE parses all verbal forms and provides meanings of particularly unusual phrases. This strength is somewhat mitigated in that ZNT provides numerous translational options for each word, whereas UBSRE provides only one option, though contextual factors have been allowed to inform these choices. Fourth, the nice big margins of UBSRE provide plenty of room for note-jotters. Fifth, the text used by UBSRE will be preferred by most students to that of ZNT—the Greek text used for the latter is the eclectic textual tradition that stands behind the New International Version. Also, like the standard UBS, maps are included for reference at the very back of the text. UBSRE is not, however, without its weaknesses. First, the lexical aid prohibits the possibility for any kind of textual apparatus—though this is true also of ZNT, and for the level of student/pastor at which these kinds of tools are targeted, the apparatus is not crucial. Second, unlike ZNT, UBSRE has oddly elected not to provide the references for OT citations. That was a surprise to me and is a bit frustrating. Third, the decision to make the definitions on the bottom of each page easier on the eye has caused UBSRE to run much longer than desirable, making it as least twice the size and weight of the slim ZNT. For academic and research purposes, either NA27 or UBS4 retain their rightful place of preeminence. And ZNT may be preferred if size is an issue—say, for the pastor wishing to take his NT on the go (though even here it is difficult to see the more convenient size of ZNT making up for the annoying italic font). But for personal reading and for increasing facility with the language, whether by college and seminary students or by pastors wishing to rekindle their skills in the original text of the NT, UBSRE is a tremendous tool. I had been using ZNT for the past few years until recently acquiring UBSRE, and I will not go back. At the end of the day, though, I am grateful for all the tools mentioned above. They encourage students to stick with their aspirations to master the Greek of the New Testament. For this and for the increased knowledge of and love for God’s holy Word that it will breed, we may be thankful to Newman and others. Wish I could take this class this summer!